« Previous: Why the American University of the Caribbean (AUC)? Philipsburg is the capital of the Dutch side while Marigot is the capital of the French side. St. Maarten is probably the only place in the world where France and Netherlands share a border, since they certainly don’t touch each other in Europe! There is still some unity on the island though… they both have nice beaches, island culture, and trade winds… And since so many American tourists come to the island each year, the American dollar is widely accepted everywhere and English is widely spoken on both sides. 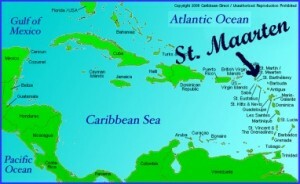 Seems like the tourists are the ones that unify Sint Maarten and Saint Martin! Oh, and like in the European Union, there are no border patrols at the international borders, and so it’s not uncommon for AUC students to live on the French side and go to school on the Dutch side, traveling internationally everyday. Live in St. Maarten/St. Martin and you’ll be a world traveler! Take the 20 minute ferry ride to Anguilla and you can add the United Kingdom to that list as well! With so many countries in so little area, the Caribbean truly is its own cute little world. I am a current applicant and was referred to your blog by an AUC Enrollment Manager, and am glad he told me about it! Would you know about any churches in the area, namely Seventh-Day Adventist churches and how far from campus? (Maybe I should read ahead a little…?). Thanks! There is a non-denominational service every Sunday held on campus, hosted by the Christian Medical Dental Association (CMDA) that you may be interested in. As for Seventh-Day Adventist churches, I’m not really sure. 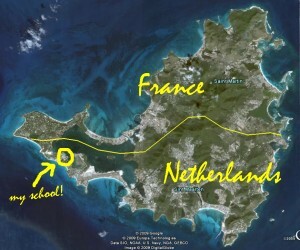 I wouldn’t be surprised if there was one however, since St. Maarten is very diverse in terms of culture and religion. Hi Benji, do you know if the on campus church service is open to family members and children? Thanks! Hey Kerri, I don’t see why it wouldn’t be. Family are always welcome on campus. Thanks for the reply! I’ll keep looking around. Good morning Benji. I will be traveling to St.Maarten Nov 2nd. I am looking for inexpensive places to shop for shoes,clothes. Will only be visiting for few days. Can you tell me where this would be please? Hope you’ll have a good trip to St. Maarten. It’s definitely a beautiful place. While there are plenty of places to shop for clothes on Front Street in Philipsburg and the markets in Marigot, they are generally more expensive on the island, even without sales tax, which the island does not have. The only thing that may be worth buying is jewelry, which you can get for good prices here. Have a good trip! My wife and I will be in St-Marteen September 5th for 2 weeks at Sonesta Maho beach! We where planning to visit the island by scooter! Any suggestions,details or prices for renting one near my hotel! Hi Sylvain, that sounds like a lot of fun! I’m not familiar with scooter rentals, as I’ve never rented before. I’m sure the hotel will know more about it. Have fun! I am going to be visiting St Martin. Can you please tell me the best most affordable must do’s that I can bring my friend to. We don’t have much money but I want o do the coolest things we can do? Any suggestions? I hope you and your friend have a great time on the island! I came across your website when searching things to do in St. Maarten, and I enjoyed reading your posts! We’ll have a cruise trip late this month and will spend a day in Philipsburg. Your post “affordable fun things…” was really helpful. This “One Small Island, Two Large Countries” article helped me to know this island better. I am particularly impressed by the med notes you’ve posted out there – so comprehensive and detailed. I am going to forward your website to my son who loves travel, nature and life sciences and also wanted to be doctor one day… I believe your passion and enthusiasm to the life, nature and to people you don’t know could be great inspiration to him. Thank you so much for all the info and I wish you a successful career and happy life with your wife Irene. P.S. I just noticed that you finished rotation at UF – Shands hospital. My husband and I graduated from UF and we had stayed there for 4 years! Thanks Lijun for visiting my site, and I’m glad you found my posts helpful! I hope you have fun on your cruise and best luck to your son! I have a question of which the answer will determine whether or not I can attend AUC. I have been looking into AUC for some time now and plan to apply for the fall of 2015. I cannot find the words to articulate just how helpful your blog has been. Truly, the “inside scoop” you have provided is invaluable. I cannot thank you enough. That being said, my question is in regards to the medication that is available on the island. I have been diagnosed with ADHD for the majority of my life – I believe it is safe to say that I have a particularly severe case. If I were to attend AUC and have any hope to be successful in my endeavor, I would most certainly need to have access to my medication. So, my question is: have you had any experience that may indicate whether or not I will be able to access my prescribed ADHD medication? I plan to speak with the AUC officials on this matter during the application process, but in the meantime, any advice from you will be greatly appreciated. I don’t see why you can’t get the medication. You could see a physician on the island who could prescribe it to you. Did you know any type 1 diabetic students (from US) while attending AUC on the island. If you did, did they take a semester supply of medicine with them?or get the meds (insulin/test strips,etc)on the island? Any suggestions for health insurance that covers meds on the island? Hi Dillon, this I do not know of. I would imagine you can see a PCP on the island, and get your meds as prescribed at an island pharmacy. You will be required to get school insurance when you get to the island. A group of us will be staying st the Simpson bay resort and marina next week. A friend of ours found your blog and shared it with everyone. This blog is amazing! I’ve told each person that I’ve mentioned it too that you write like you could work for a tourism company! Thanks so much for sharing your experience. Are you still living there? I’m glad you stumbled upon my website. I do not live in St. Maarten anymore. I moved back to the US in 2011. Hi Benji, When it comes to residency directors looking at your ERAS application, Does it matter where you went to school in the Caribbean? They will treat ALL Caribbean grads the same way as long as you have great step scores and great US clinical LORs. It can matter. If a residency director has had good experiences with residents or interviewees from a certain medical school, they will tend to handpick more candidates from that school. And if they have had bad experiences from residents or interviewees from a particular school, they will tend to ignore applicants from that school… remember, residency programs get 1000s of applications each year. This year, our family medicine program alone received 1600+ applicants competing for 8 spots. Residency directors simply don’t have time to read through that many applications, so they may apply a filter and hone in on certain factors, such as high USMLE scores, home states, or med school. These are examples, of course, and not specific to my program or any particular program, and different program directors may hone in on different factors when sifting through the overwhelming amount of applicants to try to determine whose application to even read and possibly invite for an interview. So if you come from an unfamiliar school, with poor or mediocre scores, and have no geographical ties or personal ties to the program, then likely your application may go unnoticed, sad to say. But if instead of getting mediocre scores you have awesome scores, then you will more likely be noticed. The issue with choosing a non-Big-4 school isn’t as much what the residency directors would think about you, but about where you can apply for residency in the first place. If you go to a lower-tiered Caribbean school, there are entire states that wouldn’t even allow you to do residency and practice medicine. Thank you so much for your blog – invaluable information for someone that intends to apply to AUC. Can you please give me a little bit more information about where you are at in your schooling and what the major benefits/setbacks/challenging aspects of your time at AUC. The more info the merrier… and again, thank you a lot for this wonderful blog. Hi Maria, my blog can provide more info than I can write on a reply post. Please browse my “Guide to AUC” section. Hope you find what you need. In terms of where I am in my schooling, check out my “About Me” page. Best of luck. Thanks for reading. I am planning to attend AUC this coming September 2016. I read towards the end of your post that you have known of AUC students living on the French side of the island. Did these students have to get a visa to live on the French side? Does the Dutch visa provided by AUC allow one to live anywhere on the island? Also, do you know of any good websites for finding apartments on the island? Hi Ian, congrats on getting into AUC. I am not sure how the visa works in terms of living on the French side. I wouldn’t be surprised if it does not matter. There are no strict borders between the two sides. I read some of the inquiries on your site. I have been to the island twice. to the scooter renting couple a rental car would be my suggestion. cabs r cheap to. shop phillipsburgh for souvenir oriented items. orient beach has two sides to it, both of which can be quite entertaining. you can also. let the jets take off almost within touching reach as many do by the water,. i actually forget the name but anyone on the isle knows. St. Maarten is the friendly island and the name fits well.